Taiwan’s Polytron Techologies, a subsidiary of US firm Polytronix, wants to change the way we look at (and through) glass, one of mankind’s oldest inventions. Polytron makes giant projection touchscreens, selectively opaque glass, holographic glass, LED-impregnated glass, color-changing glass, rainbow glass, and glowing glass. 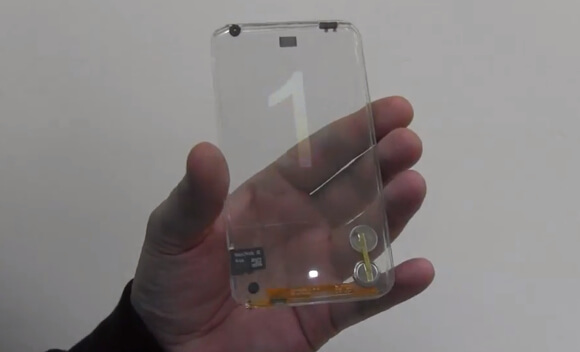 Now, they’ve set their sights on transparent glass smarthphones. See below for footage of a very early prototype. How does it work? Each Polyvision Privacy pane is a sandwich of glass, conductive material, and liquid crystal film. In its natural state, the central crystalline structure is randomly oriented, scattering incoming light to make the surface opaque. But when an electric current is introduced, the liquid crystals line up and become transparent, transmitting light from one side to the other. Polytron also makes a big transparent touchscreen monitor called the Polytouch Frame. Perhaps these two technologies combine in their transparent smartphone? If Polytron sticks to their 2013 timeframe, we’ll know more later this year. It’s easy to see how the futuristic, aesthetic appeal of a see-through smartphone might sell well. But including the small benefits (like walk-texting without tripping) and costs (like background distractions), the added utility of transparent smartphones seems minor—particularly in light of Google Glass and wearable computing. That said, transparent screens could well show up in computer-enabled glasses as an alternative to projection screens like Google Glass. Overall, as potentially cool as a transparent smartphone is, it’s the bigger theme that I like. Technology is softening the division between digital and physical, software and hardware. It’s this idea we can enliven dead materials like windows or tables or living room walls by impregnating them with conductive materials and CPUs and WiFi. Some of the coolest examples of this are happening in the art world. Consider Leo Villareal’s LED Bay Lights installation on the San Francisco span of the San Francisco-Oakland Bay Bridge. Bay Lights is a 1.8 mile long, 500 foot high, never repeating visual delight—25,000 LEDs affixed to the bridge’s vertical cables are driven by computer algorithms and $30 in energy a day. Or check out Nervous Structure from Cristobal Mendoza below. 147 elastic strands are illuminated by a projector. The digital projection responds to the physical gestures and movements of the exhibit’s admirers, while the physical strands remain motionless. Mendoza’s work sends patrons right through the digital looking glass to pluck pixels.